He had collected brains from people at different stages of Parkinson’s disease and was looking for any kind of pattern that might explain where and how the disease starts. His research led to what is referred to as the Braak stages of Parkinson’s disease – a six step explanation of how the disease spreads up from the brain stem and into the rest of the brain (see Braak et al, 2003). The Braak stages of PD. Source: Doty RL (2012) Nature Reviews Neurology 8, 329-339. Braak’s results also led him to propose that Parkinson’s disease may actually begin in the gut and then spread to the central nervous system (the brain). He based this on the observation that many brains that exhibited the very early stages of Parkinson’s disease had disease-related pathology in a population of neurons called the dorsal motor nucleus of the vagal nerve. 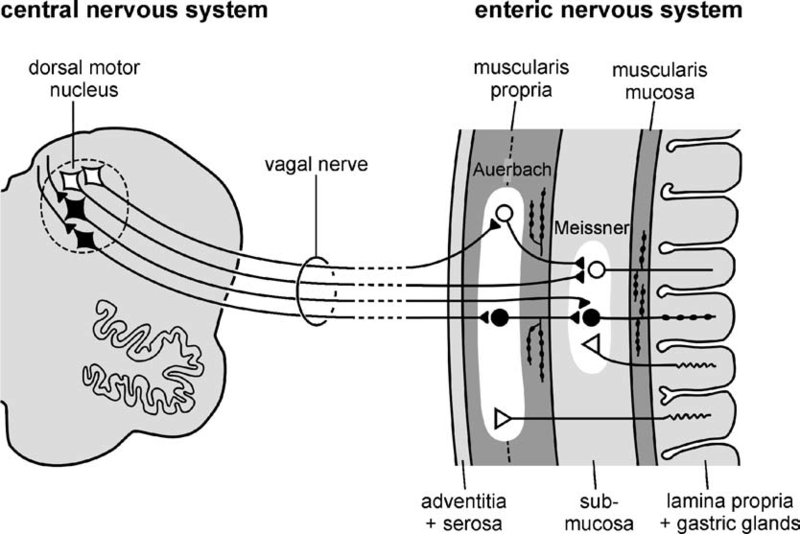 This population of neurons connects to different organs in the body, such as the lungs, heart, kidneys and the gastrointestinal system (or the gut). 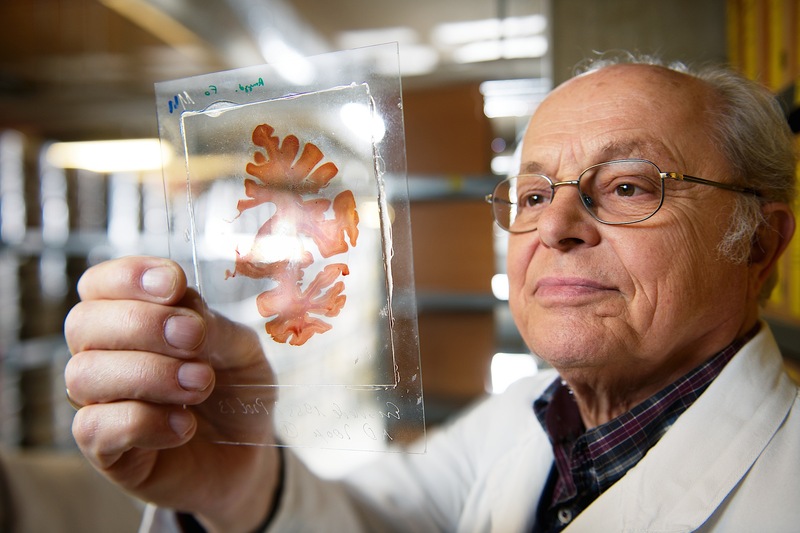 Braak and his colleagues went on to examine the nerves fibres around the gastrointestinal system and in those fibres he found large deposits of a Parkinson’s disease-related substance: a protein called alpha synuclein. These deposits were present even at very early stages of the disease, which supported his theory that maybe the disease was starting in the gut. This ‘gut to brain’ theory was supported by the fact that people with Parkinson’s disease often complain of gastrointestinal problems (eg. constipation) and some of these issues may predate the onset of other Parkinson’s disease symptoms. In addition, a couple of years ago, a group of scientists in the USA found alpha-synuclein present in bowel biopsies taken from people years before they were actually diagnosed with Parkinson’s disease (that study can be found here). The ‘gut to brain’ theory received a further boost recently with the publication of a paper by a Danish group, who retrospectively looked at all the people in Denmark that received a vagotomy between 1975 and 1995. A vagotomy is a surgical procedure in which the vagus nerve are cut. It is typically due to help treat stomach ulcers. 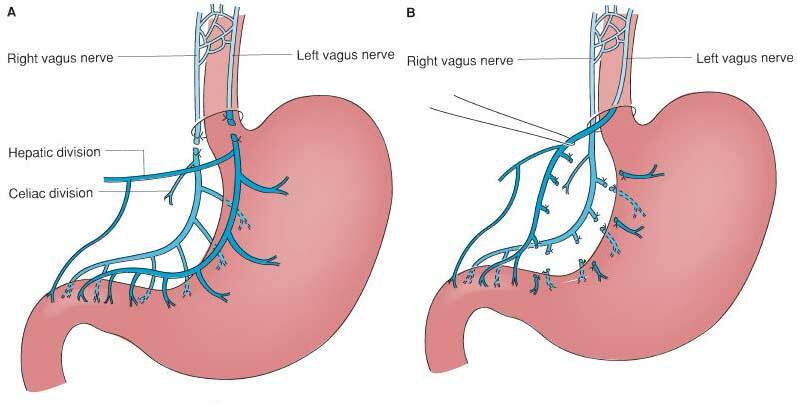 A vagotomy can be ‘truncal‘ (in which the main nerve is cut) or ‘superselective’ (in which specific branches of the nerve are cut, which the main nerve is left in tact). The Danish researcher found that between 1975 and 1995, 5339 individuals had a truncal vagotomy and 5870 had superselective vagotomy. Using the Danish National registry (which which stores everyone’s medical information), they then looked for how many of these individuals went on to be diagnosed with Parkinson’s disease. They compared these vagotomy subjects with more than 60,000 randomly-selected, age-matched controls. They found that subjects who had a superselective vagotomy had the same chance of developing Parkinson’s disease as anyone else in the general public (a hazard ratio (or HR) of 1 or very close to 1). But when they looked at the number of people in the truncal vagotomy group who were later diagnosed with Parkinson’s disease, the risk had dropped by 35%. Further, when they followed up the Truncal group 20 years later, checking to see who had been diagnosed with Parkinson’s in 2012, they found that they rate was half that of both the superselective group and the control group (see table below – HR=0.53). The authors concluded that a truncal vagotomy reduces the risk of developing Parkinson’s disease. The study is an extremely novel approach to investigating the ‘gut to brain’ theory of Parkinson’s disease and the authors can be congratulated on some excellent work. It adds further weight to the idea that something is happening in the gut very early in Parkinson’s disease. It suggests that by cutting one of the main nerves connecting to the stomach, the disease is slowed down if not avoided all together. 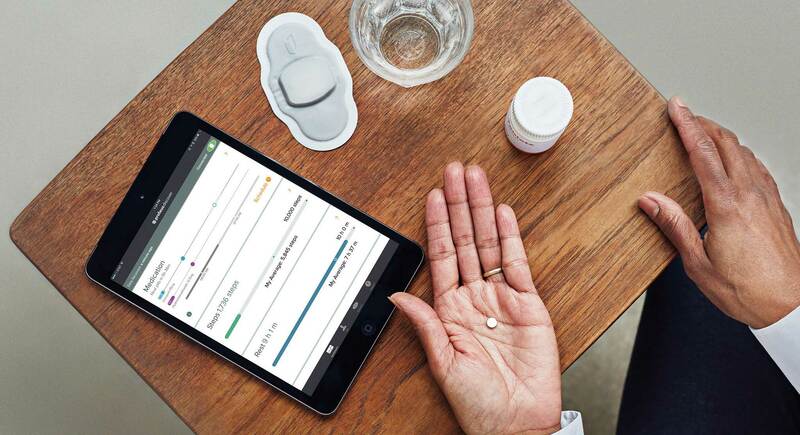 It might also suggest that the disease is slower and strikes earlier than previously thought (given that some people with truncal vagotomies still developed Parkinson’s disease – maybe the condition started before the nerve was cut). The number of people that received a truncal vagotomy (total = 5339) who went on develop Parkinson’s disease 20 years later was just 10 (compared with 29 in the superselective group). There may be some individuals who got lost in the system, but the number is still very low and caution should be used before we get too excited about a result based on a low number of subjects. It is important to determine whether this result can be replicated (in other countries). The gut may not be the only avenue for the disease. There has also been theories regarding an environmental aspect to the cause of Parkinson’s disease, and there have been studies conducted looking at the nasal/olfactory system of people with Parkinson’s disease to determine if this is another point of entry for the disease (for a recent review on this, see this paper here). In summary, very interesting study and fascinating result, but please don’t rush to your doctor and ask for your vagus nerve to be cut!